The fastest growing automotive market outside of BRIC countries, that is Mexico. The closest second contender is Indonesia by only an additional 0.6 million units of production. Mexico is projected to show a year-on-year growth rate twice as much of that at 1.5 million units of production within a period of 2013 to 2019 according to a research done by the consultancy firm Rolland Berger. Furthermore, “Mexico is the country that has signed the most free trade agreements worldwide, which facilitates exportations of vehicles and autoparts” as noted in a report published by PwC. Also mentioned in the same report, the government of Mexico continues to work together with Latin American countries in order to eliminate or reduce customs duties in South American countries. Creating greater leverage for their geographical position and its logistical advantage as an exporter to the Americas. In light of such clear market potential, Temel Gaskets made the decision to make sure its market expansion efforts include Mexico’s growing automotive and truck markets. As a part of our program, we regularly participate in the Automechanika Mexico City PAACE. We are visiting Mexico City next week to discuss new projects with our existing partners and we look forward to meeting with new prospects. In case you are planning to join us in Mexico City, we would like to share 4 business travel tips that can help make your trip a breeze. If you are traveling to Mexico City by air, you will most likely fly into the Mexico City International also known as Benito Juarez International airport. Right at the end of the terminal, immediately before the exit, you will find the booths for taxi companies. They operate with flat rates from the airport and the fee will be determined based on the area of the city you are travelling to. You’ll pay at the booth and receive a ticket to pass onto the driver. It’ll be very useful to have your hotel address printed out, so the driver will have a clear understanding of your destination. Each day of the show, once the show wraps up, you’ll easily notice the taxi line that forms in front of the main building exit. Right by the exit, will be a desk. The person attending whill help you figure out the fare for where you want to go and you’ll be provided with a ticket once again to pass to the driver. Aside from the airport and the show area, we strongly suggest taking taxis from your hotel and confirming the rate before you start the trip if you can. Your hotel staff will often be able to tell you the approximate fare so you can use that as reference. It won’t be long before you notice the fact that distances are measured in minutes rather than kilometers in Mexico City. Traffic can be a challenge during rush hours and even if you might be traveling the same distance, depending on the time of the day, you might end up taking significantly more time to get to your destination. We suggest adding at the least 30 minutes to your estimates for travel time. Especially during morning hours and in the evening hours, traffic might be more congested. On top of it, this time of the year, it’s very likely that it will rain every evening and then it will clear up to a bright day the next morning. Packing an umbrella or a raincoat will most certainly be a good use of your baggage weight limit. 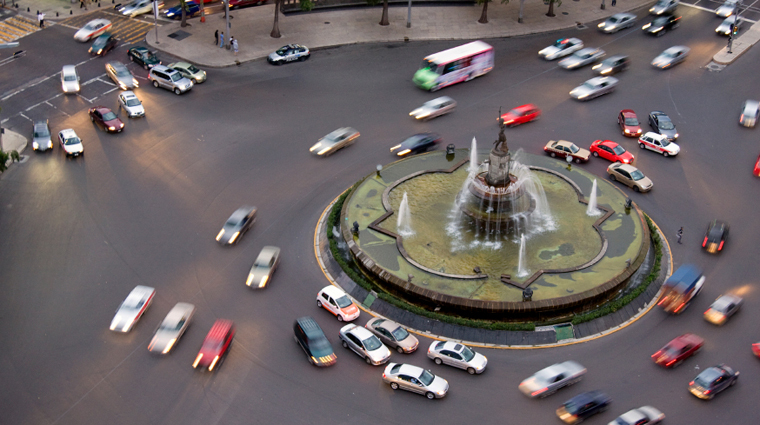 A heads up, roundabouts work differently in Mexico City. When you are driving around one and if you notice that you might be driving towards incoming traffic, just remain calm and trust your driver to navigate the vehicle around it. A good way to describe might be that there are two rings around major roundabouts and traffic flows perfectly fine around each one. Below is a photo of how cars might flow around a roundabout. When you sit down for a meeting, there will be a good bit of conversation on topics that might not be directly business related. Consider this as your warm up. It can also be considered as a positive indication of the level of interest for how much one wants to do business with another. Once the warm up period is over, you’ll notice very quickly that individuals you’ll do business in Mexico’s automotive and truck markets are experts in their topics. They are often family businesses with generations of knowledge that got passed on. Similar to many other Latin cultures, it’s very common that individuals from Mexico have two first names and two last names, all of which might be on their business card. It’s perfectly fine to ask a person which names they prefer. If you don’t have the chance to ask, the safest bet will be to take the second first name and the second last name when addressing. Usually, the first last name is the father’s last name and the second last name is the mother’s last name. If you happen to have time to explore Mexico City and the surrounding areas, we would like to strongly suggest making a day trip over to see the pyramids of the ancient city of Teotihuacan. The city center offers many options too. You may treat yourself to a colorful performance by Ballet Folklórico de México Compania Nacional de Opera de Bellas Artes, at the cultural center of Mexico City, the Palacio de Bellas Artes. They perform at the theatre twice a week and is a spectacle of pre and post Hispanic dance of Mexico. The main square, Zócalo is a must see and just quick taxi trip from most location in the city. Lastly, thousands of years of history can be found under one roof inside the National Museum of Anthropology located with Chapultepec Mark. We wish you safe travels and best of luck in your business meetings. Please feel free to visit Temel Gaskets during Automechanika Mexico City PAACE, located at booth number 4012. As always, we strongly suggest doing additional research before your trip, such as consulting with your local authorities about any legal requirements during your visit. 3 days till Automechanika Istanbul 2019 begins! Join our mailing list to receive the latest news and updates from the auto industry and the Temel Gaskets team.